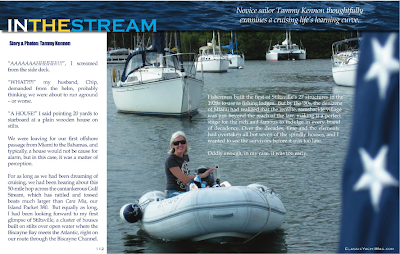 My latest column in Classic Yacht magazine has hit the web -- just as Chip and I have landed in Florida. After weeks of helping our parents, in Delaware, New Jersey (Chip) and New Mexico (me), we are taking some R&R before returning to Cara Mia. Time to gear up for another season. Good news: There will be sailing blogs soon! "I couldn't be in a better place," Mom tells me about her new room in assisted living. Today, on her 81st birthday, she looks better than she has in several years. She seems incredibly happy, even her memory has had a bounce, her sense of humor in full bloom. I have worried that she's in denial, that she's suppressing her feelings or trying to make it easier for us. I have contrived dozens of ways to check her emotional pulse. After explaining to her that we were clearing out some things in her old house, she asked me what on earth we were doing with all her stuff. "Do you really want to know, Mom?" I asked. "No, not really," she said. "Feel free to just throw it all away." At that moment, I thought about apple trees and their fruit falling and finally understood why Mom is thriving. When Chip and I left our home port in Manteo, we left behind everything we owned, house, furniture, business, photos, books and cars. We sold or donated the physical objects, but symbolically I had taken all the old chapters of my life, put them in folders and filed them in an imaginary file cabinet left behind in North Carolina. Physically and psychologically I left my old life behind and sailed away, light as the breeze in our sails. In retrospect, the leaving was as exhilarating as the new life we were entering. Mom too has embraced her liberation from her old life. She no longer takes care of everything and everyone, cooking, cleaning, buying groceries, doing laundry, paying bills. She is now on the receiving end of all the care she has doled out all these years. The past is filed away in its proper place, and Mom has sailed away, light as the breeze, pragmatically wistful about her independence but exhilarated in her liberation.